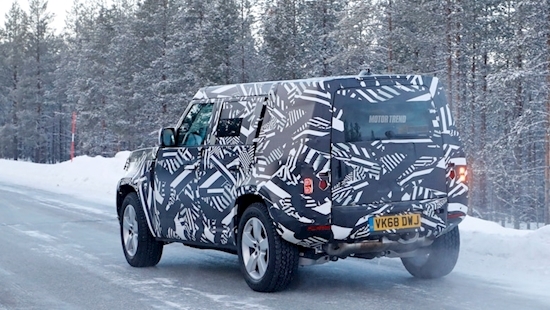 Land Rover isn't keeping its Defender prototypes a secret. Last month, the automaker released pictures of a camouflaged Defender getting muddy and posing with the Statue of Liberty. Now, we've caught the SUV playing in the snow looking a little different than before. This new prototype receives a different wrap that highlights its boxy shape. The windows aren't quite as covered up as on the first prototype, and it also features a new set of wheels. Land Rover made a bigger attempt to cover up the corners of the front end, however. If you take a peek at the rear, you'll notice this prototype isn't wearing a spare tire like the previous prototype.